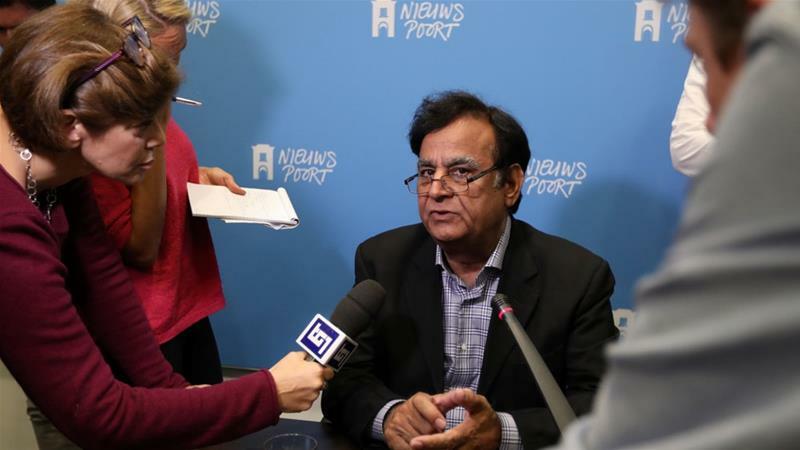 The agreement between the Pakistani government and a far-right political group that would see a Christian woman acquitted of blasphemy barred from leaving the country has no legal value, her lawyer, who has sought refuge in the Netherlands, said. Aasia Bibi, a Christian woman accused of blasphemy, spent eight years on death row after being convicted by lower courts. Last week, the Pakistani Supreme Court acquitted Bibi, saying there were "glaring and sta rk" contradictions in the evidence against her. Saif-ul-Malook, who represented Bibi for years, told Al Jazeera he fled to the Netherlands on Saturday following threats to his life. "Pakistani law is very clear. The [relevant law] says that if a person is involved in a criminal case, or tax fraud or [other] fraud, only then can the government put them on the Exit Control List (ECL)," Malook told a press conference in the Dutch capital Amsterdam on Monday. "There is no question of putting her name on the ECL." Bibi's acquittal sparked protests by the far-right Tehreek-e-Labbaik Pakistan (TLP) party in several cities, with major roads and highways blocked until late on Friday. TLP signed an agreement with the government to end the protests, on the condition that Bibi not be allowed to leave the country, and that all protesters arrested during the demonstrations would be released. On Sunday , however, Pakistani authorities arrested hundreds of TLP workers, implementing a separate clause of the agreement that said that anyone found to have damaged public or private property during the demonstration would be prosecuted. TLP Chief Khadim Hussain Rizvi was among those booked for rioting, although he has not been taken into custody. On Monday, Bibi's lawyer Malook addressed the press conference alongside Jan Dirk van Nifterik, the director of the Dutch rights group Stichting Hulp Vervolgde Christenen (HVC, or Foundation to Help Persecuted Christians), who said that they had aided him in his escape from Pakistan. "HVC was able to get him to the Netherlands, offer shelter and look after him," said Nifterik. "We are grateful to Malook for hi s work on human rights." Malook said he took Bibi's case because lawyers "do not have a religion". "[Lawyers] only ... fight for justice, and only see that no one should be condemned unless there is evidence up to the standard." Malook said that he had no information on whether Bibi had been released from jail, saying the last time he spoke to a senior jail official about the matter - on Friday night - she remained in custody. Malook himself faced numerous threats for representing Bibi, whose case has become emblematic of fair trial concerns in such cases in Pakistan. Blasphemy is a sensitive subject in the country, and at least 74 people have been killed in violence associated with blasphemy allegations since 1990, according to an Al Jazeera tally. Malook said that he spent days taking refuge at the French Embassy in Islamabad, before he was able to fly out early on Saturday morning. He flew throu gh Italy, before finally arriving in the Netherlands, he said. The lawyer indicated that he was currently on a visit visa, but that he would be staying in the European country for an unspecified length of time. He said he would call his wife and children to join him "when I have a place for them to live".